Lough Neagh is the largest water body in the United Kingdom by area and Loch Ness has the highest mean depth. The United Kingdom is made up of Scotland, England, Northern Ireland, and Wales. The UK is an archipelago comprised of the islands of Great Britain and a one-sixth portion of the island of Ireland together with other smaller neighboring islands. The UK has a wide array of water bodies and reservoirs that are both natural and man-made. In Scotland, large water bodies like lakes are known as lochs whereas in Northern Ireland they are known as loughs and in Wales, llyn. Loch or lough can also be used to refer to seawater or bodies of brackish water. In England and Wales, some of the largest water bodies are man-made reservoirs and lakes whose areas have been increased due to dam constructions. Loch Ness is the largest in volume whereas Loch Neagh is the largest by area coverage. Loch Awe is the longest water body in the UK, while Wast Water is the deepest lake in England with a depth of 754.59 feet. Lough Neagh, located in Northern Ireland, is the largest water body in the UK covering a total area of approximately 147.8 square miles. Lake Neagh provides about 40% of water to Northern Ireland. The lake’s primary inflows include River Blackwater and the Upper River Bann while its main outflow is the Lower River Bann. Lake Neagh is also the 15th largest freshwater lake found in the European Union and the 31st largest lake in Europe. Loch Ness located in the Scottish Highlands of Scotland is the largest water body by volume and also by mean depth in the British Isles. The loch has a volume 1.78 cubic miles. Loch Ness is the second largest loch in Scotland and the fourth largest in the British Isles by a surface area covering 21.62 square miles. Loch Ness is believed to contain more fresh water than all the other lakes in Wales and England combined. Loch Morar located in the Lochaber Highland in Scotland is not only the biggest water body in the British Isles having maximum depth, but also the fifth largest by surface area. The loch is the deepest freshwater body with a maximum depth of 1017.06 feet with an area covering 10.42 square miles and a 29.5 feet elevation above sea level. The loch was formed about 10,000 years ago through glacial action. Loch Morar has clear water and it is oligotrophic with a limited intake of nutrients and is, therefore, a Site of Special Scientific Interest (SSSI). 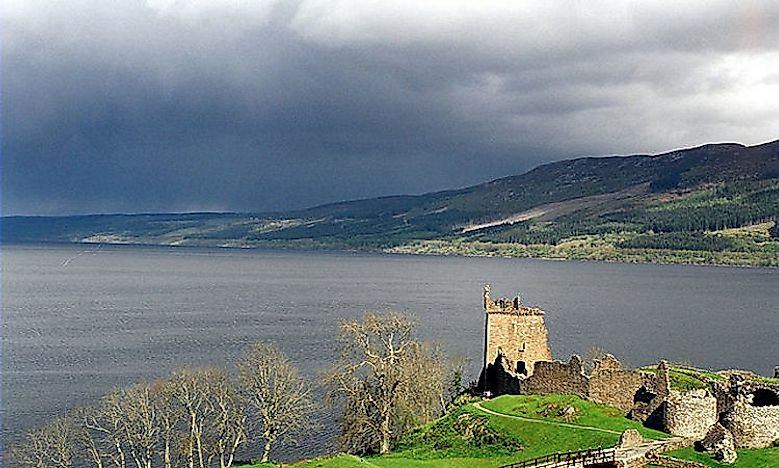 Loch Ness is the biggest water body in the British Isles not only by volume but also by mean depth. The freshwater loch which is situated in the Scottish Highlands has a mean depth of 433.1feet with an area of 21.6 square miles and an elevation of 52.5 feet above sea level. The deepest point of Loch Ness is 754.6 feet and is the second deepest loch in both Scotland and the UK after Loch Morar. The loch is made up of a sequence of interconnected bodies of water that are nebulous thus making the water visibility to be low because of the existence of great peat material in the surrounding soil. Loch Ness is most famous for its purported sightings of cryptozoological creature called the Loch Ness Monster also commonly known as Nessie. Which Are The Biggest And Deepest Water Bodies In The United Kingdom? This page was last updated on June 22, 2018.